Yosemite lands were first preserved by the United States Congress and President Abraham Lincoln who, in 1864, at the height of the American Civil War, granted them to the people of California for preservation. At that time, the federal government was very limited in size and wealth, and the concept of a "national park" had not yet emerged, so authorizing California to preserve these federal lands seemed appropriate. This original land grant comprised just under 39,000 acres (15,500 hectares), or about 60 square miles, and included Yosemite Valley and the Mariposa Grove of giant sequoias. In 1890, Yosemite was added to the new national park system that had begun with the preservation of Yellowstone National Park in 1872. The park's 200 miles (320km) of roads give access to many of its features by private vehicle and in some areas by free shuttle bus. To get to know the real Yosemite, however, leave your car or shuttle bus and travel even a short distance on a trail. You don't have to go far to discover the grandeur that can be found here and the values this special place offers. Millions of people have come to Yosemite and left refreshed and relaxed and perhaps a bit more knowledgeable about what they want out of life. 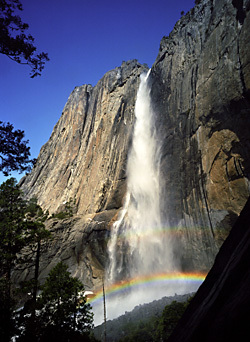 Yosemite National Park is administered by The National Park Service, U.S. Department of the Interior. Yosemite National Park is the best-known of a collection of preserved wild lands in California's Sierra Nevada, a spectacular mountain range near California's border with the state of Nevada. Yosemite National Park's fame is mostly due to the striking beauty of Yosemite Valley, whose flat floor contrasts with nearly vertical granite walls over which pour several major waterfalls. In addition to the Valley, Yosemite includes an extensive high-mountain wilderness of mountain peaks, rivers, and meadows, and groves of giant sequoia trees. Yosemite National Park lands extend from 2000 feet (600m) to more than 13,000 feet (3900m) above sea level and cover about 761,266 acres (308,000 hectares), or about 1,189 square miles.